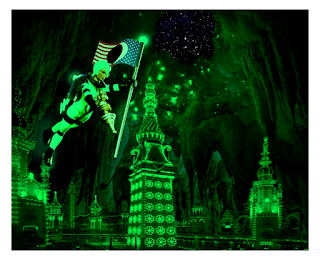 We got sent a dozen more pictures by The Outer Space Men's own Gary Schaeffer! 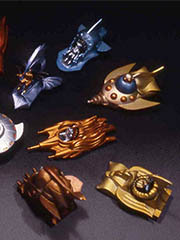 Check out more shots of Astrodite, Luna Eclipse, Zero Gravity, and Cthulhu Nautilus. Here are the new Astrodites. 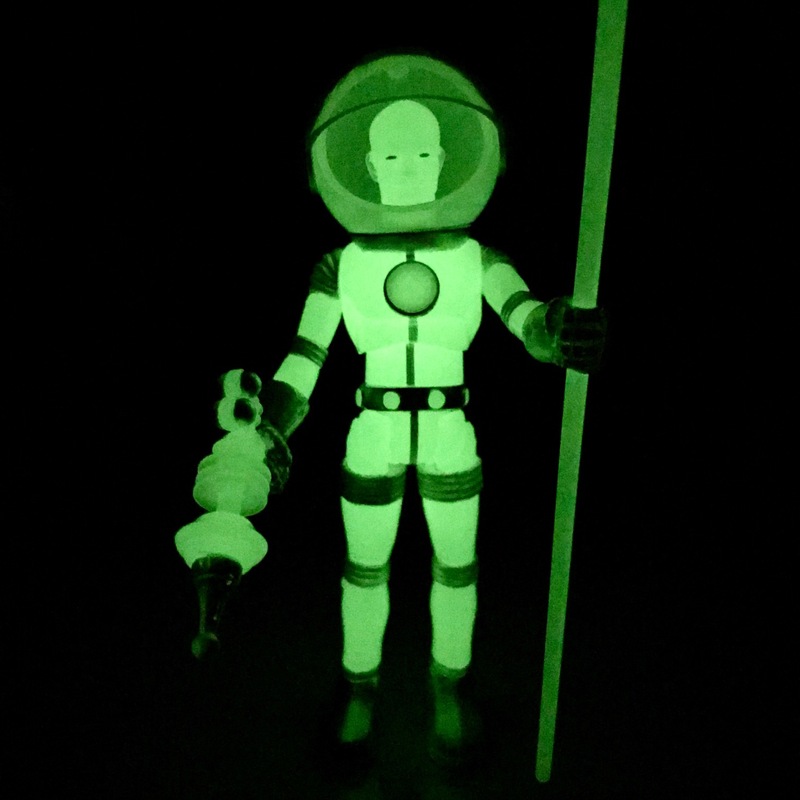 Not to be outdone, the Official Outer Space Men Instagram also added previews of 2 of the 4 new Cosmic Radiation figures. Check out Luna Eclipse and Cthulhu Nautilus! Luna (and Zero Gravity) already glow in the dark... but this time it's different. 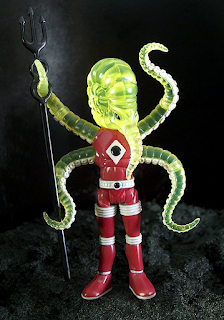 And, of course, everybody loves a glowing tentacle monster. The White Star collection must be completed! 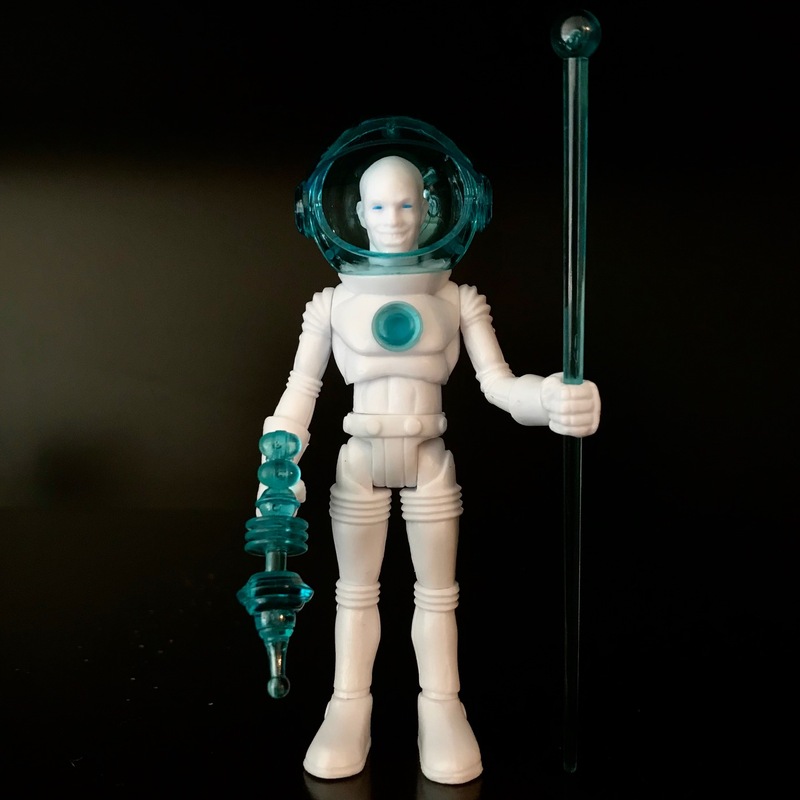 The Official Outer Space Men Instagram has been busy, and revealed the next four White Star figures - most likely coming in 2019! 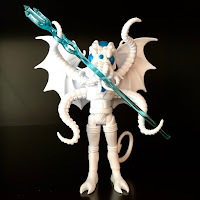 Zero Gravity, Luna Eclipse, Cthulhu Nautilus, and Astrodite are all set to join the other characters in the white plastic with blue highlights. 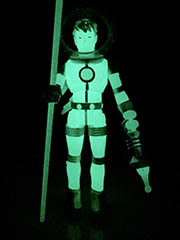 This 12-inch Sofubi Glow in the Dark Colossus Rex was delayed a long time. Customs can take a while... and I have to say when the box finally showed up in October I was almost rolling my eyes, thinking "this can't possibly be worth the price and the wait." Well, it was, and it was. It's gorgeous. It's a glowing beacon. It's incredible and I'm glad they're planning on doing at least a few more of these. 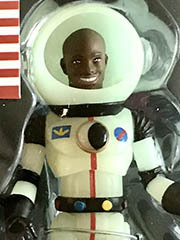 I was expecting a glow-in-the-dark version of Jack Asteroid - which we got - but to get a new character like Zero Gravity too? I'm surprised. 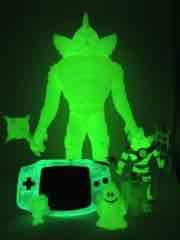 He costs more than the original Jack Asteroid figure and has less paint, but the dude friggin' glows. The fully Glyos-compatible astronaut has alternate bent/straight arms and can be taken apart at nearly every point of articulation, and then some. 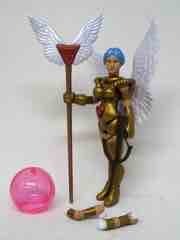 That little moon ingot pops off, the helmet dismantles to 3 pieces, and the figure has an ab and a belt joint. 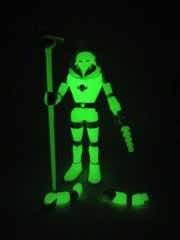 The mold should look familiar - it was first released as the glow-in-the-dark Alpha Phase Metamorpho in 2010, and was subsequently released as multiple Metamorpho and Jack Asteroid bodies, most of which was reused for other figures in the first couple years of the line. It's the perfect generic humanoid template, they could keep more heads coming and I'd probably buy even more redeco figures. A new figure! This Cthulhu-Nautilus Rieyehzoth is $22 and up for grabs as of about 5 minutes ago. It's green, and cheaper than the carded version you may not yet have purchased. 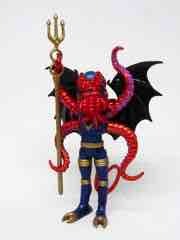 Other accessories are available, as is a special Vampire Noboto with wings from this very figure. Click here to get buying. 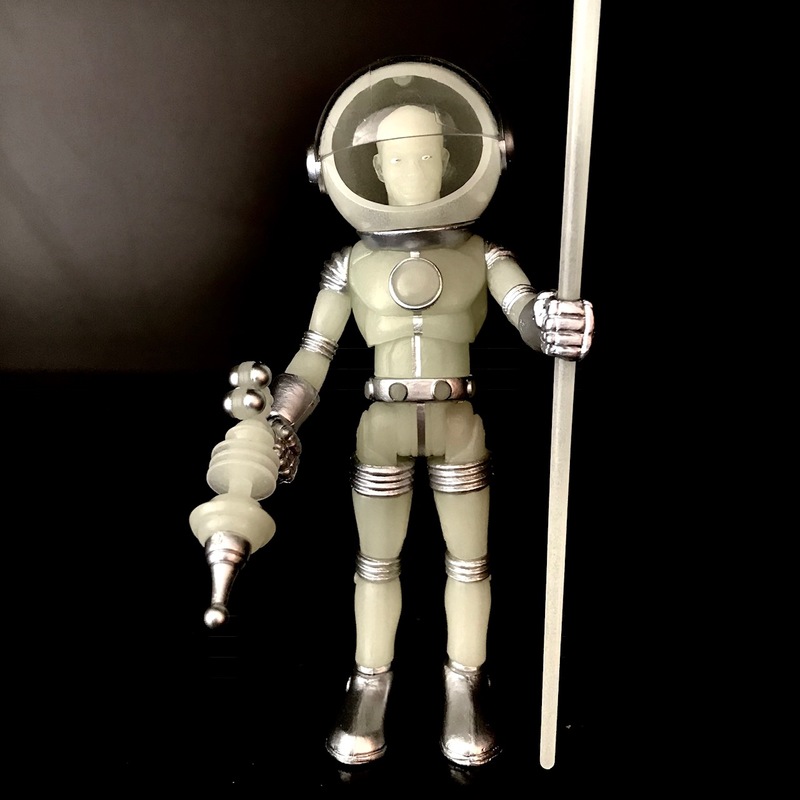 In a bit of news that's both welcome and ridiculous, the official Outer Space Men Instagram has announced 12-inch scale vehicles. Now that 3 3/4-inch figures are about $30 and 12-inch vinyl figures are $120 - so a vehicle could be easily $200 or more. No specifics or release dates were given, but do pay heed to the warning shot that fans of the line could be tapped for a significant wad of cash to keep the line complete going forward. If for any reason they don't make it out in that giant size, I for one would be very happy to see some of the mini vehicle concepts from 50 years ago realized in a cheaper, less space-intensive format. 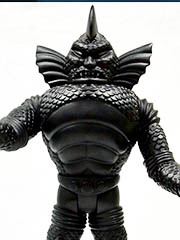 I'm excited to hopefully get my 12-inch sofubi figures soon, but if that line actually continues to completion I assume it will take up far more space than I would like - and that's before vehicles or alternate colorways come in to play. 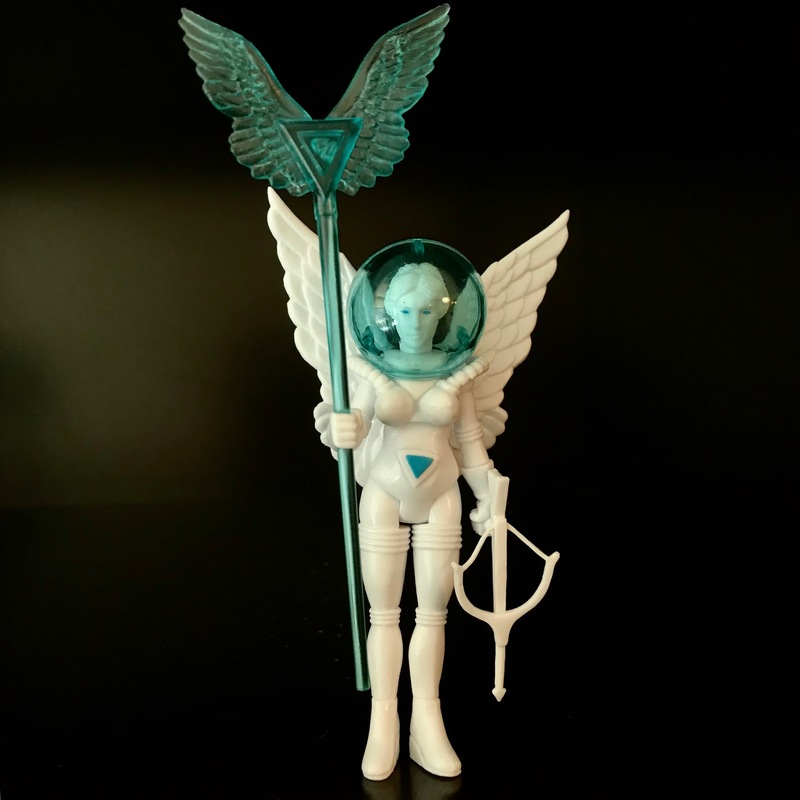 Figures like the long-awaited Astrodite make me wish the Four Horsemen's "Hopper Block" figure stands came out - she could benefit from a display stand. 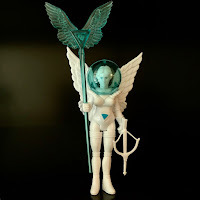 The exquisitely-sculpted figure made her debut at a Toy Fair-adjacent Four Horsemen-run party and exhibition where toy nerds ran rampant in 2013. We were waiting for this one for five years, continuing the proud tradition of making fans wait for The Outer Space Men. The figure finally shipped to American fans in 2018, with some mail orders taking a little while, but the important thing is she landed. Effectively a female Commander Comet [FOTD #330], Astrodite takes the same Glyos-based construction and gives you a new character whose ankles touch and make her hard to balance. It's still awesome. 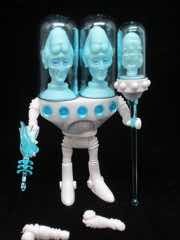 Absolutely no toy line has the right to employ the phrase "a long time coming" like The Outer Space Men. 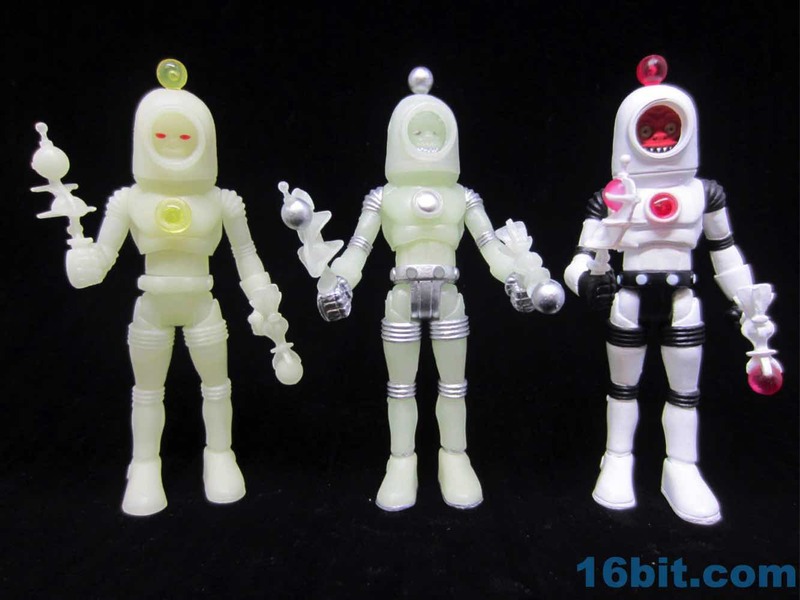 The line is 50 years old, and some of the toys took nearly 40 years from concept to product. The 45 years it took to get Gamma-X makes Cthulhu Nautilus seem speedy by comparison - the figure was teased in 2011 as a concept drawing, while the coloring and head were based on toymaker Mel Birnkrant's massive imagination. In addition to The Outer Space Men, Birnkrant also came up with dozens of other lines like the unrealized Monstro-City, and this 2018 Cthulhu Nautilus head looks a heck of a lot like a Cthulhu-inspired creature from that toy pitch. Now Available - Luna Eclipse! A new surprise release! Now available to order - Luna Eclipse! 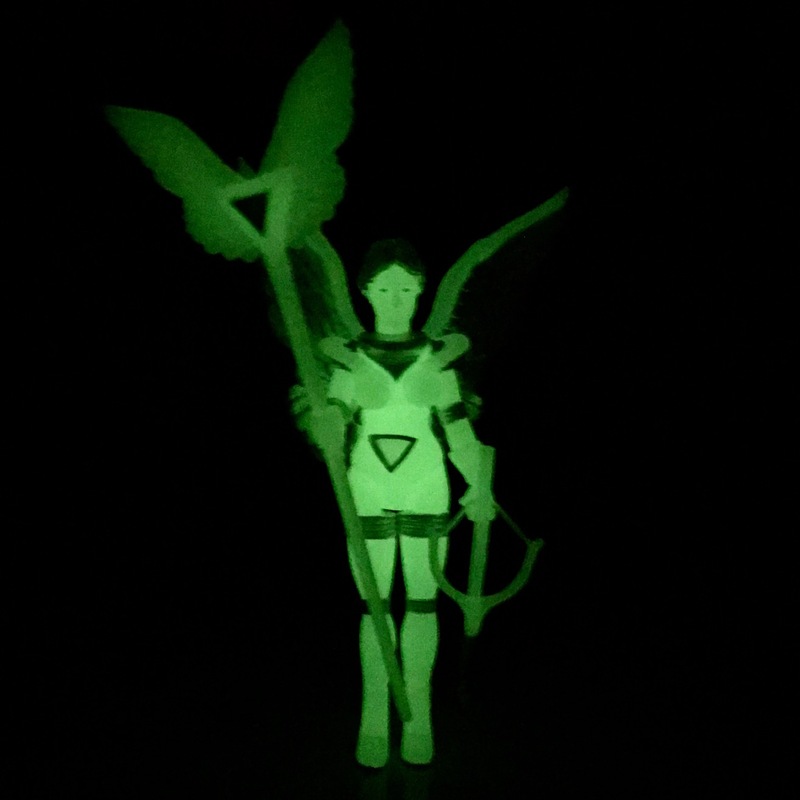 The glow-in-the-dark Woman from the Dark Side of the Moon glows in the dark and has awesome hair - and she's $30 if you get her before they sell through. Click here to order. Coming soon! Cosmic Radiation versions of Terra Firma, Jack Asteroid, Horrorscope, and Ohprometam were previewed on Instagram - take a look! It's that time! Via Instagram and elsewhere, we now know you can pre-order Astrodite at TheOuterSpaceMen.com for $35. She's one of four figures with new parts we know to be coming this year. More as we can share it! For a toy line that has proven popular, The Outer Space Men captures the imagination with strange designs. Like this one. The Cosmic Radiation Xodiac is the second Xodiac figure to have a beard, so I reached out to series designer Mel Birnkrant to ask what the deal was with the beard - is it meat? Is it hair? "It's both!" He told me - hey, that works. 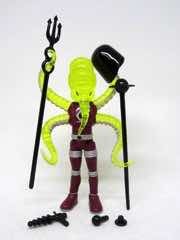 I'm a big fan of the Outer Space Men figures, especially the occasional crossovers done with Onell Design. Astro-Nautilus Redborg Syndicate was stamped out in clear yellow plastic with a hefty slathering of paint and a nice armory, too. It also costs over twice what the original release did in 2010. This one came out fairly late. Sometimes you never know what you want until you get it. 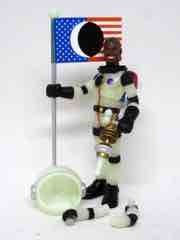 I liked seeing the various Outer Space Men in various colors, but the pigment-free versions left me a little cold. I rather liked the three figure designs that didn't previously get the White Star treatment, more than many of the ones that did. When we were teased that White Star Gemini would exist, part of me was a little miffed it wasn't in color. But I'd be lying if I said it didn't turn out nicely - there's a lot of blue here that breaks up the white. It's good. 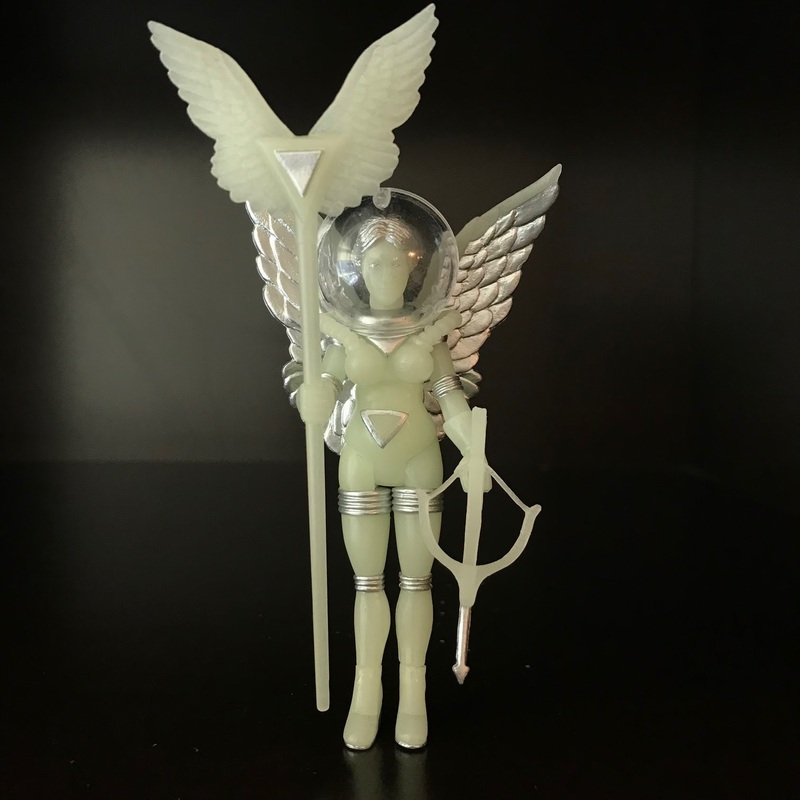 I won't say it's as amazing as some of the other Gemini they've put out, but it's very good and it does a nice job of showing you the sculpting. Unlike, say, the clear ones. 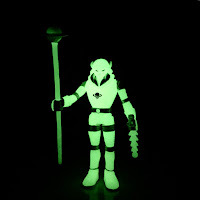 Available right now: The Outer Space Men Cosmic Radiation Glow in the Dark Xodiac! It's $20 at the Outer Space Men Shop, and it's great. 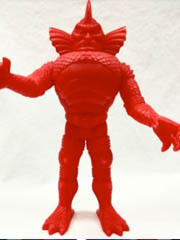 Our review is in the works and since we're in full Toy Fair prep mode, should be up in a few weeks. It's just as bright as the other ones, with great markers like his fingers, joints, beard, and Saturn symbol showing up nicely. Click here to order yours if you haven't done so.